Florida may as well be known as the RV capital of the world, with numerous RVs which cruise through the state boundaries every day. Recreational vehicles, or RVs, are substantially larger than typical motor vehicles, and with that size is potentially dangerous and significant accidents on the roadways. It’s important to know that if you or a loved one has been involved in an RV accident, there may be some compensation that is entitled. Just in the year 2014 alone, there were approximately 250 accidents involving a recreational vehicle throughout Florida. That number is small in comparison to the total number of vehicles involved in accidents throughout Florida. The size and weight of an RV can contribute substantially to the amount of damage and resulting injuries that occur from an accident. RV units are not able to correct and adjust their driving as easily as a typical motor vehicle is able to do, and are therefore more likely to be involved in an accident. The state of Florida is known as a comparative negligence state – That means a victim will be entitled to bring a claim for damages against the party who is responsible, up to the amount that the other driver is at fault for the resulting injuries. For example, if the other driver caused the accident, but the victim had not buckled their seatbelt (leading to more severe injuries), the number of damages can be decreased by the percentage in which the victim was found to be at fault for their injuries. An insurance company will likely try to contact you shortly after the accident in an attempt to settle the amount of damages without the filing of a claim. It’s critical to consult with a personal injury attorney before accepting any settlement. Insurance companies are in business to make money;therefore, they will try to coerce a settlement for a rate that is lower than what the victim is entitled to receive. Insurance companies will further try to coerce the victim by promising a quick payment, versus the months of litigation that a personal injury claim may lead to. However, it is important that you are correctly compensated for the damage which was done to you and your vehicle during an RV-related accident. 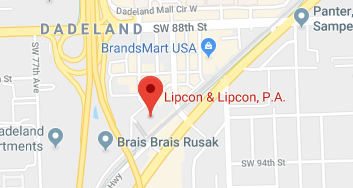 If you or a loved one were involved in an accident involving an RV, contact one of our attorneys of Lipcon & Lipcon. Each one of our attorneys has several years of experience in handling car accident claims, such as those caused by RVs. RVs seem to take over the Florida highways at times and can cause extreme injuries to everyone involved in an accident. Our attorneys will work diligently to make sure you receive the compensation that you deserve from the injuries you have endured. Contact our Miami office to obtain your free consultation.